Eliza Luff Crossland was born on Red Lion Street, London, England June 6, 1851, the third child in the family, all the daughters of Junius and Frances Ann Otton Crossland. Eliza's two older sisters were Amelia and Frances. Another sister, Emma, was born in America. In the year 1853 the Crossland family sold out its belongings in England and set out upon its journey to Utah in the Jacob Gates Company. The ocean was safely crossed but the long, arduous trip across the plains proved too much for the father and the family was compelled to give him a hasty burial where he died (near Green River, Wyoming) and to continue the journey westward, sorrowing and alone. 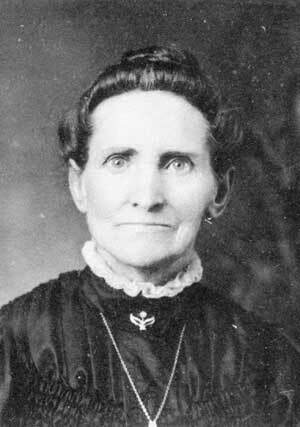 A fourth daughter, was born at Keokuk, Iowa, May 30, 1853. No record has been preserved as to the exact date of his death or place of his burial except the approximation given above. Arriving in Utah, the family made a home in Salt Lake City and lived there for six years, the mother earning a scanty living for her four little ones by working in shops or homes of the Saints. One day during the absence of the mother, Indians came to the little home seeking food and gave the children a very bad scare. However, they were unharmed. By dint of unceasing toil, the little mother with the aid of Amelia, the eldest daughter, was able to provide the absolute necessities of her small family. In 1859 Frances Crossland married William Adams of Pleasant Grove, abandoning her Salt Lake home to join her new husband. Adams had with him an aged mother, blind and almost helpless, and three children, William, Eliza, and John by a previous marriage. His new union added five more to his family and afterward three more children were born to him by Frances Crossland: viz., Alice, Ann, and Joseph, making in all a family of thirteen. It was seldom, however, that all were at home at one time, although it was not unusual for ten to be there at once and all housed in a single room. How they all found sleeping quarters in a mystery. The congestion was eased somewhat by John and William sleeping in the granary. It is impossible for those who have always enjoyed plenty to understand the poverty and want that were found in this home. Being half clothed and half fed, it is marvelous how young children passed through the rigors of those pioneer winters. Some of the younger ones had no shoes in either summer or winter. If they had occasion to go outside in the winter (toilet accommodations were outside) they had to be carried on the backs of other members of the family fortunate to have shoes. The two boys who slept in the granary had but a single buffalo robe as a bad covering in winter. Like the clothing, the food was poor in quality and insufficient in quantity. At the beat of times, bread, bacon, and potatoes were the bill of fare, but two small pigs did not last long in a family of ten and so meals often consisted of bread and potatoes. Under such conditions was Eliza reared. It is small wonder that saving, thrift, and frugality became second nature to her. In many respects, Eliza fared better than some other members of the family because she "worked out" a fair share of the time. From the age of eight until she was married she practically earned her own living. Some of the people for whom she worked were Edward Davis, Lewis Robison, John Wheeler, William Ashton, and Dan Smith. Eliza's educational opportunities were very limited. Perhaps three or four three-month terms were all she was able to attend. Her entire school equipment consisted of one Wilson Reader, one elementary speller, and a slate. Her educational attainments thus acquired were very meager, in fact it was not until after her marriage that she really learned to write and that but with great effort. At the age of 18, Eliza married Franklin Cyrus Banks, December 6, 1869 at the Salt Lake Endowment House. Eliza proved to be a most exemplary wife and mother. Thrifty, energetic, sympathetic, liberal, aelf-sacrificing were her leading characteristics. She made the best of the most trying situations. Her resourcefulness helped her out of many a tight place. Her habits of strict economy acquired through years of poverty remained with her throughout life even when surrounded by plenty. The supreme test of the character of Eliza Banks came during the years 1885 - 87 while her husband was on a mission. She was left with a family of seven small children, a farm, and a number of horses and cattle to look after. Frank was the oldest boy, 11 years of age at that time, but he was not able to take the responsibility left him by an absent father. The farm was let out on shares but it was so poorly tilled that the yield decreased at least 50 per cent and since the family received only half of the produce, the returns from the farm were only one-fourth of what they formerly were. To support a large family on one-fourth of the usual income and at the same time send money into the mission field was a task that only those who had become inured to hardship and privation could successfully undertake. Eliza Banks was fully equal to the task. The children were fed and clothed and the money was sent promptly into the mission field when needed, but no one knows except those who passed through it what an effort it required, how many sleepless nights the mother spent planning and scheming, how many hours darning, mending, and remodeling clothing, picking and drying fruit, planting, weeding, harvesting, all when she should have been waited on by others. One must search far and wide to find a greater example of uncomplaining self-sacrifice than Eliza Banks exhibited upon this occasion. During the first fall of her husbandís absence, she remained out husking corn until she got far behind with her winter sewing. In order to catch up, she operated a foot treadle sewing machine so that her baby which was to come soon was a stillbirth. But the end was not yet; greater, trials were in store for this already sorely tried family. In June, 1886, the mother, Edna, Frank, and Junius set out for Salt Lake City in a buggy drawn by Danger, a high spirited little bay horse. Frank was allowed to get this horse only under protest because his unmanageability was fully known, All went well until the party reached American Fork. Here an attempt was made to transfer the reins to Frankís hands. In the exchange the reins slackened and the horse, taking advantage of the less rigid restraint, dashed forward at a tremendous speed. The mother seized the reins once more and to check the animal in his mad flight, turned him across the railroad track. As soon as the wheels struck the rails the occupants of the buggy were thrown violently out. The mother, still clinging to the reins, was dragged some distance over the rails and ties to be picked up later totally unconscious. Edna received very severe bruises especially about the lower legs but the others escaped injury. The accident occurred in front of the Thomas Barrett, home, where the injured were immediately taken and medical aid summoned. Upon arriving the Doctor declared that Eliza was suffering from concussion of the brain and had practically no chance for recovery. Relatives assembled expecting her death at any moment, but still she lived on, unconscious the while. Finally at the end of the third day she regained consciousness much to the surprise of the Doctor but to the unbounded joy of the family. Eliza's recovery was slow but certain, three years passing before she was fully restored in mind. Her mental strain was greatly relieved at the return of her husband from the mission field in the fall of 1887, although physically she was far from well, causes other than the accident contributing to her illness. The girls by this time were fairly well grown and, thanks to the early and thorough training given them by their mother, they were well able to look after the housework. Edna, perhaps, was the greatest help at this time, but in the spring of 1895, Edna married so that the responsibility of the work fell upon Ellen and Violet. Eliza's condition grew constantly more serious until much of her time was perforce spent in bed. Various physicians were consulted and treatments followed but to no avail. Several times her very life was despaired of. Finally an operation was decided upon, but only after much deliberation an operation in those days was performed only when oneís chances for recovery without the operation were fewer than those with it. Almost to the a surprise of everyone the operation was a success and Eliza rapidly gained strength until her complete recovery was effected. One of her friends in commenting on her struggles for health and her final victory remarked, "Oh, you'll live forever and then turn into a buckskin string." With continued good health, she enjoyed many happy hours and years with her husband and friends. Sadness, however, came to her when her husband suffered a paralytic stroke affecting his whole right side including a portion of the brain. He was no longer able to converse and joke with his friends and the home atmosphere suffered a dampening. He recovered slightly but before long he succumbed a third stroke leaving Eliza a widow at the age of 71 years. She stood up bravely under the loss but her life thereafter became saddened and lonely. She spent much of her time with her needle and sewing machine making a quilt for each child and each, grandchild. The time came, however, when failing eyesight would not allow further fine work or reading. Life then became a burden to her as never before and she spent idle hours. Failing hearing, too, made her life still more unpleasant because she could not converse intelligently with her relatives and friends. There came a time when she prayed daily to be allowed to go to her husband whom she refused to refer to as dead, but just "gone away." Eliza persisted in living in her own home until failing health and memory made it necessary for her to go to her children. Her time was spent with Edna, Ellen, and Junius, but mostly with Edna. She felt more at home there than anywhere else except in her own home. Due to her mental condition her last years were very upsetting as she imagined herself to be living in her girlhood days and among strangers and her constant request was to be taken to her own people. Peace came to her on February 20th, 1940 when she passed away at Edna's home. 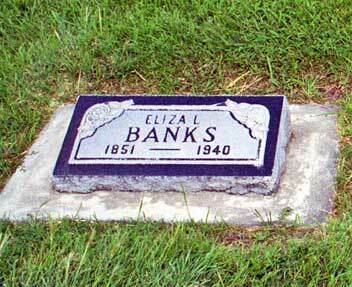 Eliza Banks lived the life of a consistent Latter-Day Saint, She was honest and truthful, loyal to the church. free in her contributions and lived her religion conscientiously. The following are some of the positions she accepted with credit: President of the Y. W.M. I. A., Counselor in Relief Society, Teacher in Sunday school, Visiting Teacher in Relief Society, Treasurer of Relief Society. She highly respected by all who knew her. Her liberality, sympathy, and helpfulness were proverbial. Her greatest happiness consisted in making others happy.